All of the restaurants in Aspen are great, but you sure have to pay the price! If you plan on eating out, expect to pay around $30 per person…. excluding drinks. We found an exception to the Aspen dining “norm” with this hole in the wall pizza joint called New York Pizza. They have a wide variety of items on the menu including whole pies (with extra toppings only costing you $.25 cents each), salads, subs, sandwiches, and calzones. Like I said, the prices are very reasonable. I love the atmosphere of this place. 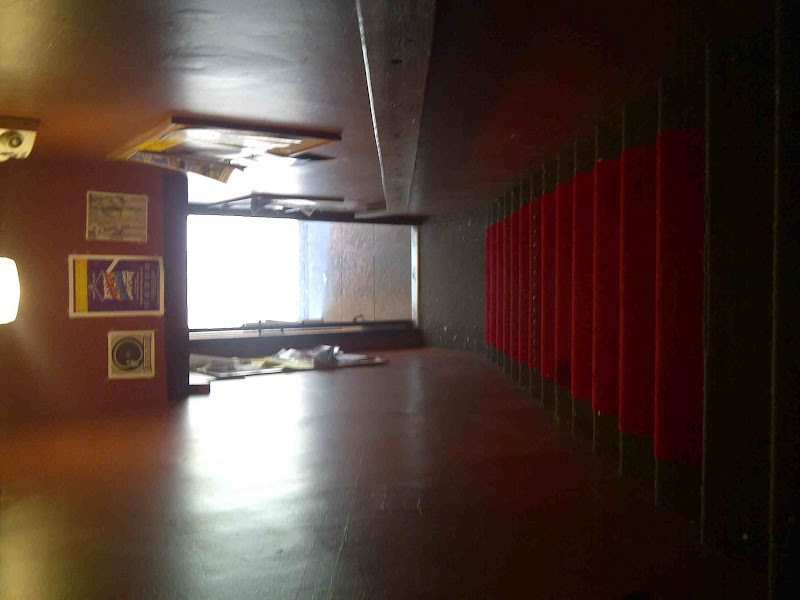 Walking up the red carpeted stairs, you feel like you’re leaving Aspen and entering New York City. Literally a hole in the wall… you have to walk upstairs to find this restaurant. 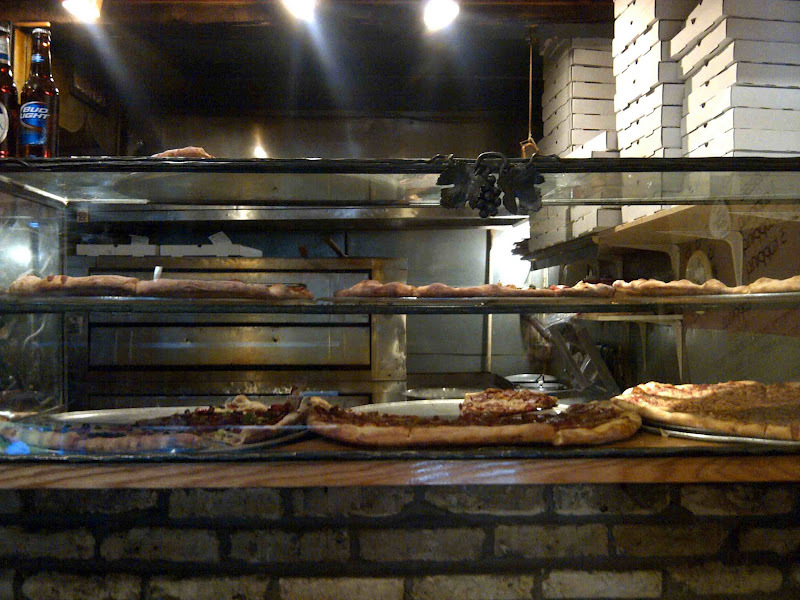 Upstairs, you’re greeted with the smell of warm pizza, stainless steel ovens, and pizza-by-the slice. For less than $5, you can get a HUGE slice of pizza of your choice. Choose from pepperoni, cheese, canadian bacon and hamburger, veggie with Feta, black olives, onions, and peppers and more! We ordered a greek salad to-go and all loved it! 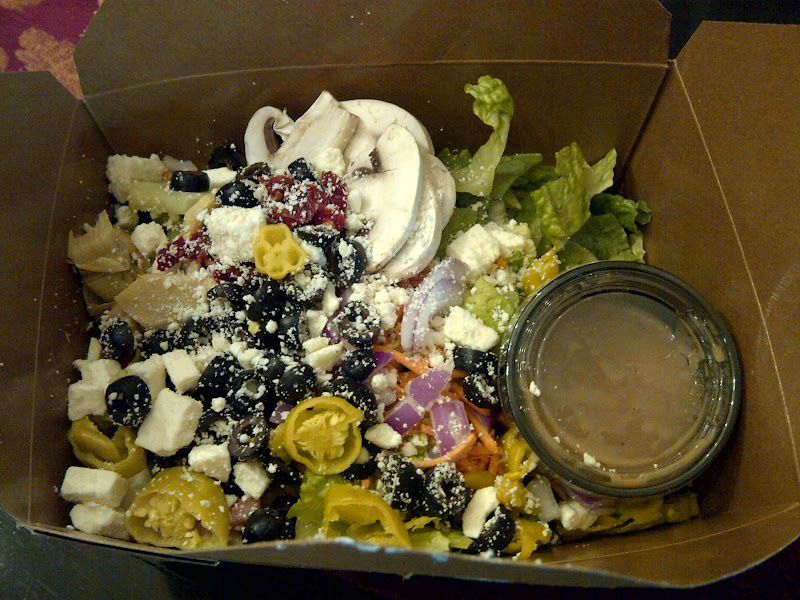 Topped with plenty of Feta cheese, extra-large mushrooms, sun-dried tomatoes, black olives, peppers, diced red onions, sliced tomatoes, and romaine lettuce, it sure was a winner. The dressing is some sort of vinaigrette, which I also thoroughly enjoyed. Finally, take a look at this New York pizza! The crust was thin and chewy, the toppings fresh, and the cheese savory. My dad ordered half canadian bacon and hamburger for himself, while my husband requested pepperoni. If you’re looking for something cheap and tasty in Aspen, New York Pizza is a winner. It sure beats Dominoes, which is also located in Aspen. However, why would you eat Dominoes when you can have New York style pizza? 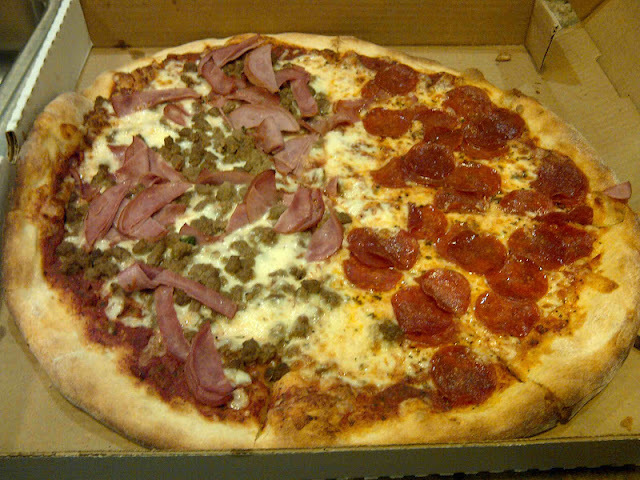 Large, 16 ” pizza: half canadian bacon/hamburger and half pepperoni.